Every time Tiger tees up these days there’s talk about whether he’s going to be back or not. Well, I have a prediction for 2012 but before I give you that I first have a preamble. Tiger Woods’ main reason for playing golf is to win 18 + Majors so he beats Jack Nicklaus’ record. A major is a different kettle of fish than a regular playing event. And I think that the Majors are where you’re going to see Tiger shine in 2012, because that’s what he craves more than anything in golf. The other tournaments I think you’ll see him be up there but I don’t envision him winning tournament after tournament like he used to. And I don’t think Tiger would be too concerned about that because he’s preparing to win Majors. And in the majors I think you’ll see Tiger up in contention a lot more. I predict that Tiger will win at least 1 Major this year. I would be surprized if he didn’t. To be honest I’m sick and tired of commentators comparing Tiger to ‘pre-accident’ Tiger. That’s in the past. History has been written on what happened then…whether we know everything or not, who cares. The fact is, Tiger is a different golfer today than he was before that incident. That’s an undeniable fact. Is he ever going to be that same golfer before that incident? Is he going to beat Jack Nicklaus’ Major record? If he stays healthy for the next 4 – 5 years and he putts well, it’s going to be interesting to see him give it a crack. You Can’t Increase Your Swing Speed – Or Can You? I’ve heard other golf teachers say you can’t train to increase your swing speed. That is ignorant and stupid. Just like in the example above about training a person to run faster. While it’s true that some golfers will always swing faster than others, naturally it doesn’t mean YOU can’t increase your current swing speed. And increasing your swing speed is the easiest way for you to gain distance. Because for every mph you increase in swing speed means an extra 2.5 yards in distance. Well, you just can’t try to swing faster. What you need to do is train your body to move faster. A simple way to train to swing faster is to get a golf club and then swing as fast as possible for about 8 seconds. Then take a rest for about a minute and repeat again. You should do about 3 sets of this. Then when you go to swing normally you’ll automatically be swinging faster. You won’t be trying to swing faster it will just happen as a result of your training. There’s many more exercises like that in this program that you can do to improve your swing speed and consequently hit longer drives. But what I’ve just given you is an example to help you get started. If you train properly to swing faster you’ll be shocked with how much distance you can gain. When I’m faced with a pitch shot off dirt I find it very tough to hit a good shot consistently. Do you have any advice on how I can improve my success rate with this shot? Hitting off hard pan lies is tough….for any golfer! 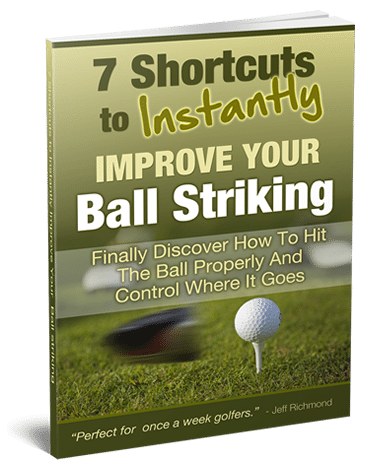 But it’s a shot you should practice often because it will really improve your entire ball striking performance. Now obviously when you’re playing a ball off dirt it’s critical that you contact the ball first. Failure to do so will result in a very bad shot. To help you do this you want to make some setup changes. First, you need to position the ball further back in your stance. The ball should be no further forward than the middle of your stance. And I even suggest you try placing the ball further back than this when you’re practicing to see what works best for you. When playing a pitch shot off dirt you’re trying to hit the ball first with a slightly descending blow. By setting up your ball further back in your stance you’ll help to do this. Next, you must make sure that your hands are placed ahead of the club at address. This is to encourage the hands ahead at impact. What will also help to hit the ball first is to place about 70 – 80% of your weight on your left side at address, and keep it there throughout your swing. Finally, when playing these shots you should try to use a wedge or a 9-iron. Only use a sand wedge or 60 degree if you absolutely have to. Because there’s more bounce on a sand wedge/60 degree wedge and that will mean your contact will have to be perfect. With a wedge/9-iron you have a small amount of tolerance to miss the ball slightly and still get away with a half decent shot. When you hit these shots perfectly you’ll get a lot of spin on the ball which makes it exciting. And one last thing…you must be aggressive with these shots. You don’t use a lazy type of swing with these shots. You need a short, sharp swing that contacts the ball first. That gets a lot of zip on the ball and makes good contact a lot easier. One final thing….practice these shots a lot. 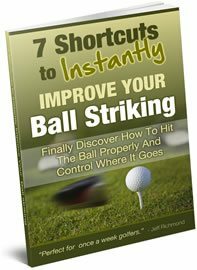 It will only help improve your entire ball striking. OK, that’s the end of this issue of the Consistent Golf Gazette. I hope you’re enjoying these weekly newsletters. We’re getting closer to The Masters all the time. Can’t wait!